Vision To Learn launched its Georgia effort in August 2017, with events at Michael Hollis Innovation Academy and Welcome All Park & Multipurpose Center. Vision To Learn’s first Georgia vision van will provide free vision screenings, eye exams, and glasses to students in Atlanta Public Schools (APS) throughout the 2017-18 school year. 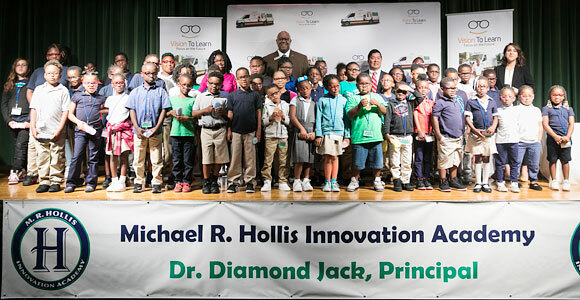 APS Superintendent Meria J. Carstarphen attended the Hollis Academy launch event, at which 49 students received glasses. Vision To Learn’s Atlanta program is supported by the Atlanta Hawks Foundation. In addition to financial support, the Hawks Foundation will participate in several glasses-dispensing events at schools located near Hawks community basketball courts. Hawks players, mascot Harry the Hawk, and Hawks Cheerleaders will appear at schools to help celebrate kids’ receiving their new glasses. The first Hawks-themed event took place at Fickett Elementary School in December 2017. With the help of local partners such as Chick-fil-A and Learn4Life, Vision To Learn will seek opportunities to serve students throughout the Atlanta metro area. In APS alone, an estimated 7,500 APS students need glasses; and in the larger metropolitan area, an estimated 60,000 children are in need. David Lee, Executive Director of the Atlanta Hawks Foundation, with a student at Fickett Elementary, in Atlanta, December 2017. Superintendent of Atlanta Public Schools Meria Carstarphen with a student who just received glasses at Michael R. Hollis Innovation Academy in Atlanta, August 2017. A stage full of kids at Hollis Innovation Academy in Atlanta, August 2017. Atlanta Public Schools Board of Education District 2 representative Byron Amos stands tall in the back row.